Today, it is fairly safe to say that blogs are a prominent part of the media. It may not exactly have come into the fold of mainstream media, but it is a force you cannot ignore in sharing of information. With this increased value of blogs in sharing of information, there has been a corresponding increase in the commercial value of the blogs and what they share. It has been proven that you can make a fortune using a blog but it all comes down to pulling traffic and that is what this post is aimed to help you do. You may have the best content on your site but what you need people to visit your blog and take a look at the content. Whether yours is a new blog or an old one that needs to revamp and improve on traffic flow it, the aesthetics of the blog are central to the performance of the blog. 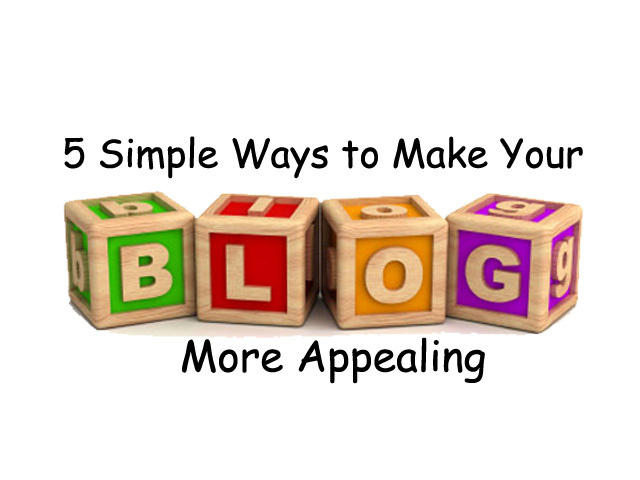 Therefore, that is the one area that this article takes interest in as it highlights the ways in which you can make your blog more appealing. The human mind is scientifically proven to process visual information up to 60,000 times faster than it does text.This phenomenon explains why so many people are drawn to visual content such as images and video way more than they are too plain text. With science on your side, using images on your site is one sure way of making your blog more appealing by adding their draw to it and breaking up blocks of text that would otherwise be repulsive. You are encouraged to ensure that for every post that you put there is at least one relevant image to go with it. Please underline the word relevant because images can do more than just attract people, they are also important tools of communication. How so? You would wonder. Well, if people are drawn to images they will most likely remember them better too. If it is relevant to the topic, then your blog will be etched in yourreaders’ minds even if they do not read much of the text content. Therefore, you kill two birds with one stone simply because the internet is awash with free and cheap photos on all topics you can think about. If you are using one of those dull stock themes on your site, they could probably be working against you. You do not necessarily have to hire a professional designer to get the desired effect on your blog, but you must appreciate that you rarely get a decent return on a cheap investment. A custom theme will be more flexible and better suited to your needs and most are also better for SEO and future upgrades. This is the age of octa-core smartphones so you can understand how no one wants to sit and wait for a slow blog to load. Therefore, in designing your blog, limit the features that may slow down itsloadings such as plugins and widgets. You are not guaranteed that clients will come back to your blog to check for content, but there is a better chance that they will get onto their Facebook or Twitter timeline and see what the latest news is. You can sure make an impression on your visitors on the blog, but you can appeal better to them on a regular basis via social media. Make sure, then, that your social media buttons are prominent on your blog for the users to be able to follow you easily. You could have the best designs and killer images but without text or readable text, for that matter, that is like having flesh and no skeleton. No one can make sense of it. Over and above readability, ensure that your content is artfully written to keep readers coming back and subscribing. The presentation is a highly sensitive area in the determination of your content’s readability. Therefore, ensure that there is enough contrast between the font color and the background. However, do not let this limit your creativity in combining colors, but whatever you do, make it legible. Most internet users scan articles to get a gist of the contents before reading it. If they like it, they go back to the beginning and read your article in its entirety. Therefore, ensure that the headings and subheadings you use are interesting, authentic, and memorable; the kind that makes readers expect a new perspective or authentic content from you. Portents Idea generator provides you with ideas on topics that you can write on. Proofread.Grammarbase provides professional level proofreading services, ensuring that all your articles are perfect in language. Resumes Expert: to equip users with all skills when seeking jobs. Soovle helps you find important and relevant keywords for your niche that the readership relates with. Having too many advertisements on one same blog is likely to drive away traffic from you and in all honesty, no single advertisement job is worth losing your traffic for. You are thus advised to concentrate on building an audience that is loyal and who will inform what type of advertisers come to you too. Cutting yourself a niche in a specified area ensures that you become an authority in the area, increasing your credibility to the clients and value to advertisers. The audience is the master you are serving in all of your writing and you can be sure that they like to know who is providing the information they are consuming. They also tend to develop preferences among the people that create your articles and your content has more appeal if that is the author penning some articles. It also provides a way for you to establish which author pulls more traffic and you may decide to use their content more for the sake of traffic. Having gone through this article, you realize that making your blog more appealing does not to be as difficult a task as it sounds. It is a matter of identifying people like and catering to these tastes. Like in a relationship, attracting, creating, and strengthening a bond between you and your audience is the cumulative result of little efforts that in the end make the browsing experience easy, fast, and smooth.